The Giants also gave Connor Barwin a 2-year, $5 million deal as a reserve. To be blunt, the return on the investment was quite poor. The 3-4 defense relies on the linebackers to be the the play-makers and the pass rushers. They didn’t do that. As a team, the Giants had 30 sacks, tied for 30th in the league. Only the Raiders had fewer. And of those 30 sacks, 17 came from the linebackers. Only two linebackers on the team picked off a pass. Most startling, Giants linebackers only forced ONE fumble all year. Ask a Giants’ fan about their linebacker memories for the 2018 season and they’ll probably mention Ogletree picking off five passes and returning two of those for touchdowns. Or Goodson picking off two passes in a game. They may say that the injury-prone Vernon flashed as a pass rusher as he got healthier. And that Carter showed some good things as a rookie. But mostly it was just blah. Barwin was invisible. Martin was one-dimensional. The positives from Vernon were overshadowed by a frustrating lack of impact and bonehead mistakes such a penalties or losing contain responsibility. Overall, the run defense wasn’t good, with players often being out-of-position or being successfully blocked out of position. And pass coverage against tight ends and backs remained a sore spot for yet another year (despite the five picks, there was a stretch of games where Ogletree was regularly abused in coverage). Olivier Vernon’s first three seasons with the Giants have been sabotaged due to nagging injuries, including a high ankle sprain in 2018 that caused him to miss the first five games of the season. Vernon started the remaining 11 games, accruing 30 tackles, 7 sacks, 1 pass defense, and 1 forced fumble. Despite the missed time and subpar tackle production, Vernon played in the Pro Bowl as a first alternate. Vernon was originally drafted in the 3rd round of the 2012 NFL Draft by the Dolphins. The Giants signed him as a free agent in March 2016. Although Vernon played in all 16 regular-season games in 2016, a serious left hand/wrist injury affected his play. In 2017, he missed four games with an ankle injury that also continued to be a factor in other games. An undersized but athletic defensive end, the Giants shifted him to linebacker in 2018 to fit their new 3-4 scheme. Vernon teases with his big-play ability but he simply hasn’t been able to stay healthy and be consistently productive and reliable. The Giants signed Kareem Martin as an unrestricted free agent from the Arizona Cardinals in March 2018. Though not a standout, Martin has his most productive season as a pro, playing in a 16 games with seven starts, and finishing with 48 tackles (twice as much as his previous high), 1.5 sacks, and 2 pass defenses. The 6’6”, 272-pound Martin was originally drafted in the 3rd round of the 2014 NFL Draft by the Cardinals as a defensive end. The Cardinals moved him to linebacker after his rookie season. Martin is a ‘tweener who does his best work moving forward rather than moving backwards in space. He is a sold run defender, but he only has six career sacks in five seasons. The Giants drafted Lorenzo Carter in the 3rd round of the 2018 NFL Draft. Carter played in 15 games as a rookie with two starts, finishing the season with 43 tackles, 4 sacks, and 4 pass defenses. He is a tall, athletic, disruptive forward mover. Carter causes problems with his quickness and closing burst but can get hung up on blocks at times. Carter flashes as a pass rusher, and he can rush the passer from the defensive end spot in certain packages. The Giants signed Connor Barwin as an unrestricted free agent from the Los Angeles Rams in July 2018. Despite playing in 15 games with three starts, Barwin finished the year with just 12 tackles, 1 sack, and 4 pass defenses. Barwin was originally selected in the 2nd-round of the 2009 NFL Draft by the Houston Texans. Before joining the Giants, he spent time with the Texans (2009-2012), Philadelphia Eagles (2013-2016), and Rams (2017). The Giants traded with the Rams for Alec Ogletree in March 2018, giving the Rams 4th- and 6th-round draft picks. 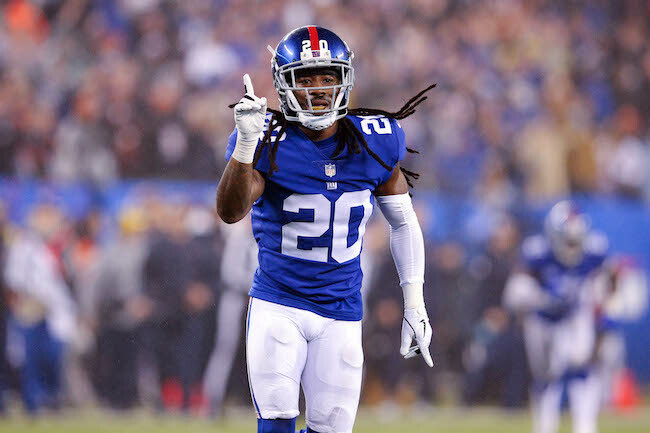 In his first season with the Giants, Ogletree started all 13 regular-season games he played in, missing three games due to hamstring and concussion issues. He finished the year with 93 tackles, 1 sack, 8 pass defenses, and 5 interceptions (2 of which were returned for touchdowns). Ogletree was drafted in the 1st round of the 2013 NFL Draft by the Rams. He made the All-Rookie team in 2013 and was named second-team All-Pro in 2016. The 6’2”, 235-pound Ogletree lacks classic size. He’s more of a run-and-hit linebacker than take-on-and-shed guy. Team leader who was voted team captain on both the Rams and Giants. In his six NFL seasons, Olgetree has averaged almost 100 tackles per year. Despite his five interceptions in 2018, he can be exposed in man coverage by athletic pass catchers. In his third year with the Giants, B.J. Goodson had his most productive season, playing in 15 games with 13 starts, and finishing with 61 tackles, 0.5 sacks, 4 pass defenses, and 2 interceptions. Goodson was drafted by the Giants in the 4th round of the 2016 NFL Draft. As a rookie, he played in 15 regular-season games with no starts. In 2017, Goodson started all seven games he played in, but missed most of the season with shin and ankle issues. Goodson is a big, strong, physical linebacker who lacks ideal speed and quickness. He plays the run better than the pass. The Giants signed Tae Davis as an undrafted rookie free agent after the 2018 NFL Draft. Davis not only made the team, but he played in 14 games with four starts, accruing 33 tackles, 2 sacks, and 1 pass defense. The 6’0”, 222-pound Davis lacks size, but he is a good athlete with fine speed. While aggressive, Davis is not a physical player against the run and he missed too many tackles in 2018. He also needs to improve in coverage. The Giants claimed Nate Stupar off of waivers from the New Orleans Saints in September 2018. He played in all 16 games, finishing the year with just 14 tackles. In his one start, Stupar missed three tackles. The 6’2”, 240-pound Stupar was originally drafted in the 7th round of the 2012 NFL Draft by the Oakland Raiders. Stupar has spent time with the Raiders (2012), Philadelphia Eagles (2012), San Francisco 49ers (2012–2013), Jacksonville Jaguars (2013), Atlanta Falcons (2014–2015), and Saints (2016–2017). He has played in 79 regular-season games with ten starts, six of which came in 2016 when he accrued 58 tackles. Stupar missed 11 games in 2017 with a torn ACL. He is a good special teams player. Ukeme Eligwe was signed to the Practice Squad in September 2018 after he was waived by the Kansas City Chiefs. The Giants signed him to the 53-man roster in October 2018. Eligwe ended up playing in 10 games with no starts, accruing just seven tackles and one pass defense. The 6’2”, 239-pound Eligwe was originally drafted in the 5th round of the 2017 NFL Draft by the Chiefs. Avery Moss was signed to the Practice Squad in September 2018. Moss was originally drafted in the 5th round of the 2017 NFL Draft by the Giants. As a rookie, he played in 11 games with two starts. He finished with 14 tackles, two pass defenses, and one forced fumble. Moss has good size with long arms and is a good athlete. Moss flashes as a disruptive run defender and pass rusher, but he needs to become more consistent and get stronger at the point-of-attack. Jordan Williams was waived/injured in September 2018 with hip and shoulder injuries, and then placed on Injured Reserve. Williams was originally signed by the New York Jets as an undrafted rookie free agent after the 2015 NFL Draft. He spent time with the Jets (2015) and Miami Dolphins (2015-2016) before being signed by the Giants to the Practice Squad in December 2016. He spent most of 2017 on the Giants’ Practice Squad, even though he played in one regular-season game. 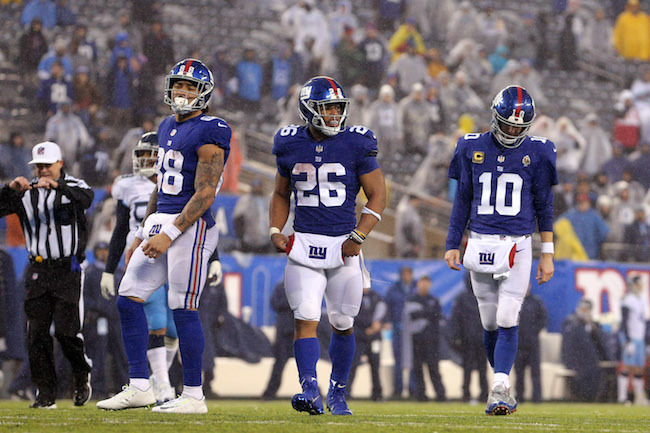 The New York Giants saw their slim playoff hopes evaporate on Sunday as the team was shut out 17-0 by the Tennessee Titans at a rainy MetLife Stadium. The Giants are now officially out of the playoff hunt. With the loss, the Giants fell to 5-9, guaranteeing their fifth losing season in the past six years. While Tennessee only passed the ball for 86 net yards, the Titans out-gained the Giants in first downs (22 to 15), total net yards (301 to 260), net yards rushing (215 to 47), and time of possession (35:21 to 24:39). The Giants’ five first-half possessions ended with four punts and a sack as time expired. Yet only trailing 7-0 at halftime, quarterback Eli Manning had two killer turnovers to start the second half, including a bad interception and fumble. The Giants survived the first, but not the second as Tennessee’s second touchdown near the end of the third quarter all but officially sealed the game. The Titans added another field goal in the fourth quarter as the Giants punted two more times. Until New York’s last drive, the closest the Giants got to the end zone was the Tennessee 29-yard line. The Giants reached the 4-yard line on their final possession but turned the ball over on downs. Manning finished the game 21-of-44 for 229 yards, no touchdowns, and one interception. He was also sacked three times. His leading receiver was tight end Evan Engram (8 catches for 75 yards). Running back Saquon Barkley was held to 31 yards on 14 carries. 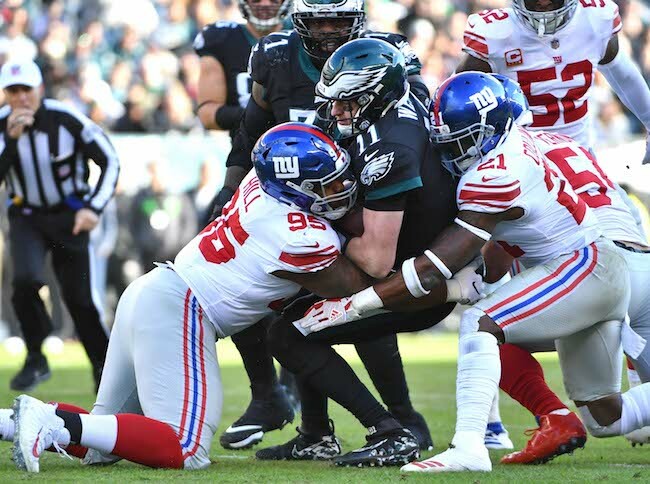 The defense kept the Giants in the game until late in the third quarter, but they did not create a turnover and only had one sack (by safety Michael Thomas). Inactive for the New York Giants were wide receiver Odell Beckham, Jr. (quad), quarterback Kyle Lauletta, tight end Garrett Dickerson, center Evan Brown, nose tackle John Jenkins, cornerback Tony Lippett, and safety Kamrin Moore. Center Spencer Pulley (calf) and cornerback Antonio Hamilton (quad) both left the game with injuries and did not return. Defensive end Kerry Wynn (unknown) had post-game x-rays taken. Head Coach Pat Shurmur and select players will address the media on Monday. Tight end Rhett Ellison (ankle) did not practice on Wednesday. Wide receiver Odell Beckham (quad) practiced on a limited basis. Safety Curtis Riley (wrist) fully practiced. The Giants terminated to the practice squad contract of punter Brock Miller on Monday. The Giants filled that roster vacancy by signing defensive lineman Woodrow Hamilton to the Practice Squad. The 25-year old, 6’3″, 315-pound Hamilton was originally signed as an undrafted rookie free agent by the New England Patriots after the 2016 NFL Draft. The Patriots waived him in September 2017 and he spent time with the New Orleans Saints in 2017 and 2018. Hamilton has played in two regular-seasons games with one start. The Giants practice again on Thursday and Friday in preparation for Sunday’s game against the Tennessee Titans. Opening Remarks: I’ll try to update you first on some of the injuries of note. Odell (Beckham) came in today, felt a lot better than he did Friday and Saturday. He received some treatments over the weekend, so he feels better and we’ll just see where that takes us. It’s too early to tell. Rhett Ellison, as you know, had an ankle sprain during the game, feels better, we’ll just see how the week progresses for him. Then Curtis Riley had a wrist sprain that they’re getting checked out. I don’t have any details on that at this point. Beyond that we’ve just got a little bit of game wear and tear. Not much to add after last night, it’s fun to win a game – fun to win a game in that fashion. It’s very rare you ever get to 40 to nothing on a team, that’s a very unique experience, it’s hard to do, and I credit our players for getting us to that point. They did an outstanding job of playing hard. Things sort of bounced our way, but we made enough plays along the way to take advantage of some of the things that we had to. As I say every Monday, we’re back in the moment, we’re getting ready to play Tennessee, and we’re finishing up the corrections from yesterday. Monday’s, in my mind, are more important than Wednesday. You have to clean up things. That’s why it would be extremely rare they get a ‘Victory Monday’ because I think this is an important day to fix the things that may show up as we finish the season. With that, I’ll try to answer your questions. Q: What do you value about Alec Ogletree, both as a leader and as a player? A: You sort of answered it in your question. He’s a leader because he has courage and he does the right thing at the right time for the right reasons, doesn’t care about the consequence, but in order to be a leader you have to be really good at what you do. He’s had a chance to get turnovers, I think he played one of his better games. Again, he’s played well, he’s playing better and better and better, I guess I could say. He’s played well throughout the season, but he’s playing better and better, and that’s a credit to him. Q: Are you giving him an offensive package? He has five receptions. Q: Was it just kind of a process for him to get used to this defense and the system? A: No, I think he’s played well throughout. It’s easy as you look at a play, and a player has high expectations, to maybe look at a play or two that doesn’t go well and say he’s not playing the way he should, but Alec has played steady throughout the season and played very well. He’s just made more impact plays probably in the past few games, but his presence has been felt throughout the season. Q: Eli (Manning) said yesterday he thinks the offense is starting to run through Saquon (Barkley) more and more. Obviously the success you’ve had since the bye, was there a tipping point where you saw something and thought that was the direction that would yield the best results? A: I think it’s all connected. I’m an old offensive lineman, and I understand the importance of blocking. I can remember when Lorenzo White and Andre Rison and Bobby McAllister were getting praise for doing what they do, the five of us (linemen) sat in the corner, drank one more beer, and were just happy about the fact that we were winning games. It starts up front, and I think our guys are doing a better job blocking, which helps the run game. It’s much easier as a play caller also to call runs when you’re gaining yards, and when you hand the ball to a runner that can score touchdowns. I thought his touchdown run, I’ve never seen him run that fast, even in college. I think there’s data to tell us that was pretty fast. And everything plays off itself – it helps the play action, it helps the quarterback, his feet are clean because they think it’s a run, so it all plays off itself. If we’re playing right, then we need to be able to run the ball. Q: What did you see when you looked at your wide receivers, the way they’ve contributed as blockers? A: There’s some terrific blocks. I thought Sterling Shepard, he had some terrific blocks. The one long run, he kind of slid back and blocked 36, and that was the key block that sprung Saquon, and then on Saquon’s next run, he flipped around and saw 24 and had a good block that helped spring him even further. That’s his nature, he’s gritty, he’s tough, he understands the importance of being a good blocker and he found his way in the end zone as well. Two Shep’s and a Bennie scored for us, but the group themselves, I thought they did a good job. Q: Size-wise, you don’t have the biggest receivers out there. A: I think they’re typical of what receivers look like. There’s some certainly that are bigger and some are smaller, but I’ve never thought that we’ve had a small group of wide outs. Q: This offense, the way you’re playing now, do you think it bucks a trend in the league, and if so, are you ok with that? A: I really don’t care about trends in the league. I think we as coaches have to do what’s best for our team based on the players that we have, but from the beginning of time, a team that can run the football has a better chance to play good team offense. I really believe this, and we just played two really outstanding defenses. We saw what the Bears did last night against the Rams certainly, and we were able to score against them, and I really thought the Redskins defense is a top-tier defense in the league. But defenses are too good if you just start the game dropping back and throwing them. I think you’ve got to be able to run the ball throughout, and it helps not just for your offense but for your whole team. I don’t know if that’s bucking a trend, but I think that we as coaches all know that. Q: You drafted Saquon where you did and have said many times why you valued that pick at that position. Do you think no matter who your quarterback would be, that if you draft a Saquon number two and he’s the kind of player he is, that it makes sense to tailor a lot around this guy as opposed to whoever the quarterback is? A: It all goes hand in hand. You just can’t put Joe Schmo in at quarterback and think you’re going to win games. You’ve got to have a guy that can play the position. But the best friend of a quarterback is really the running back, because he can take some pressure off of him, but the running back can’t do it unless you block for him, so it’s all connected. That’s what we’re seeing. I think from an offensive standpoint we’re seeing a much better connection, that’s the way I would phrase it, since the bye – blocking, running, throwing, scoring points. I think in the last five weeks we’ve scored over 30 points a game, which in the first eight would have been tough to say, so it all goes hand in hand. Q: What did you think of (Evan) Engram bouncing back coming off an injury? A: Yeah, bouncing back from injury, I thought he did a terrific job. He had some explosive gains, he did a good job in the run game as well, got a couple knockdowns. It was good to see him have success. I’m rooting for him because I think he really works hard at being a good player. The guys that really work hard at it – right is right, you’ve got to go out and do it – but the guys that really work hard at it, I’m pulling for to make sure that they do well. Q: Isn’t that second part especially important for him? If he’s putting some guys on the ground in the run game, that can enable the play caller to have him on the field? A: Sure, more situations, absolutely. I think that’s, really unless you’re the quarterback, sometimes when you run reverse, it is what he has to do. Unless you’re the quarterback, everybody has to block for the runner. Everybody does, so tight ends certainly – it’s in everybody’s job description, and especially tight ends. Q: You said there was data on Saquon’s fast run? A: No, I’m just looking at it, but I know that they take data. There’s people that look at that kind of stuff, but when I was watching the run and then saw it again on the tape on the train ride home, just my naked eye and it looked like he was running pretty fast. Q: It was the fastest running back touchdown this year. 21.91 miles per hour. A: Somebody told me that. It all goes hand in hand. Everything’s connected. Q: What was it that you guys did so well up front defensively when you looked at it? A: Yeah, I thought we did a good job in the run fits, which was important so you didn’t allow Adrian (Peterson) to go that way fast. The one thing about Adrian, if he hits it, he can do what Saquon did on his run, so we were able to make him kind of have to move his feet side to side, which then negates all his skill and ability, so the run fits were very good. Then I thought we tackled better. I think we had a couple that kind of spit out, one comes to mind where the back backed up, or it spit out and Jackrabbit did a good job of a one-on-one tackle that could have been a big run if he missed it. Really in the run game, it comes down to run fits and tackling, and I think we did those two things better than we did at times in the last couple of games. The Giants improved their all-time regular-season record against Washington to 100-68-4 to become the first NFL franchise with 100 regular-season victories against another franchise. Quarterback Eli Manning’s 197 passing yards increased his career total to 55,142. He is the seventh quarterback in NFL history with at least 55,000 passing yards. 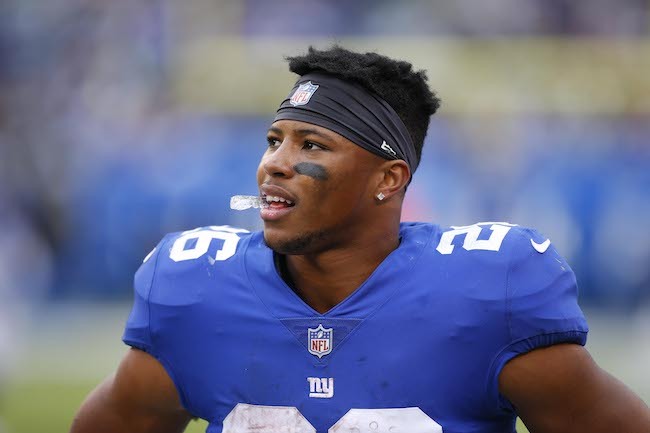 Running back Saquon Barkley extended his Giants rookie record by increasing his season total to 1,124 rushing yards. Barkley’s 1,000-yard season is the 24th in Giants history, and first since Ahmad Bradshaw’s 1,015 yards in 2012. Barkley’s 1,124 yards is the highest total by a Giants back since Bradshaw ran for 1,235 yards in 2010. Barkley scored his 13th touchdown (nine rushing, four receiving), a new Giants rookie record. He had been tied with running back Bill Paschal (12 in 1943) and wide receiver Odell Beckham, Jr. (12 in 2014). Barkley has five touchdowns from scrimmage this season of 50 or more yards, the most ever by a Giants rookie. Barkley’s four receptions increased his season total to 78, breaking a tie with tight end Jeremy Shockey (2002) and moving into second place on the Giants’ rookie list. Beckham is first with 91 catches in 2014. The players are off on Tuesday and return to practice on Wednesday. 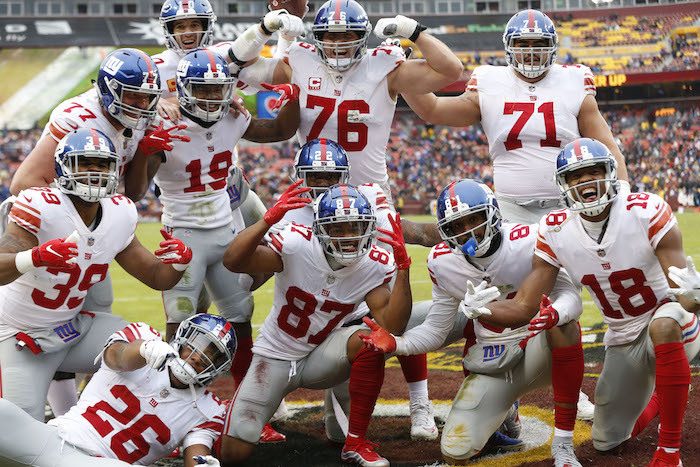 The New York Giants improved their overall record to 5-8 by destroying the Washington Redskins 40-16 on Sunday afternoon at FedExField in Maryland. The game was 40-0 in the 3rd quarter when the Giants pulled out some of their key starters. Wide receiver Odell Beckham, Jr. also did not play in the game due to a quad injury. The bulk of the first quarter was pretty ugly for both offenses. The Redskins and Giants each punted three times to start the game with both teams each only picking up two first downs. The New York avalanche of points began late in the first quarter when free safety Curtis Riley picked off a a deflected pass from quarterback Mark Sanchez and returned it nine yards for a defensive touchdown. Then after a three-and-out by Washington, the Giants went up 10-0 by driving 43 yards in nine plays to set up a 35-yard field goal by place kicker Aldrick Rosas. 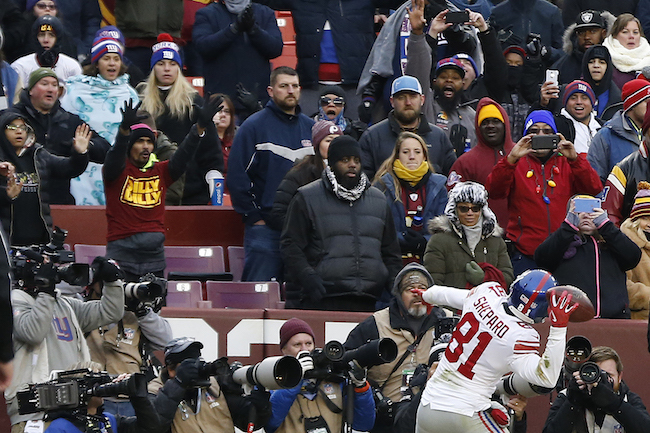 After the Redskins went three-and-out again, the Giants blew the game open on the first ensuing offensive snap. Running back Saquon Barkley ran away from the Washington defense on a 78-yard touchdown gallop. Giants 17 – Redskins 0. It only got uglier for Washington. Linebacker Alec Ogletree picked off a deflected pass at the Washington 28-yard line and returned it to the 10. On 3rd-and-goal, quarterback Eli Manning found a wide open wide receiver Sterling Shepard for a touchdown and a 24-0 advantage. 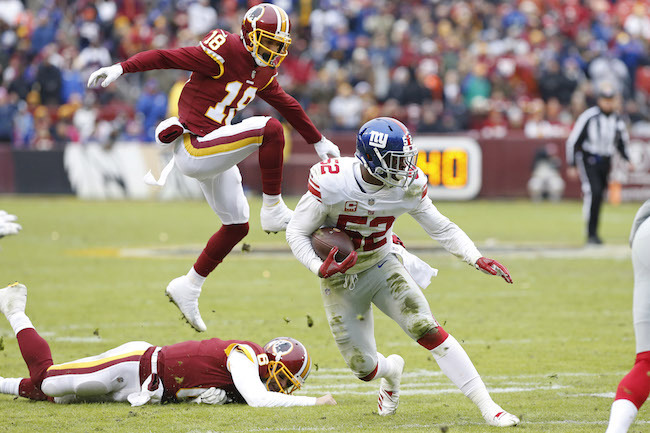 The Redskins went three-and-out, and spurred by a 52-yard run by Barkley, the Giants got into the endzone again right after the 2-minute warning when Manning threw a 6-yard touchdown pass to wide receiver Bennie Fowler. Still the Giants were not done. The Redskins went three-and-out and the Giants got the ball back with 56 seconds left on the clock. A 39-yard pass to tight end Evan Engram set up the Giants at the 5-yard line. New York settled for a 23-yard field goal as time expired. At the half, the Giants led 34-0. Both teams exchanged punts to start the second half. On New York’s second possession of the third quarter, the Giants drove 81 yards in nine plays, culminating with an 11-yard touchdown pass to wideout Russell Shepard. The extra point was missed, but the Giants were now up 40-0. The Redskins benched Sanchez and the Giants began to pull some of their starters. The rest of the game anti-climatic and a bit sloppy, reminiscent of a preseason contest. Washington’s next drive ended on a failed 4th-and-2 conversion attempt at the New York 22-yard line. 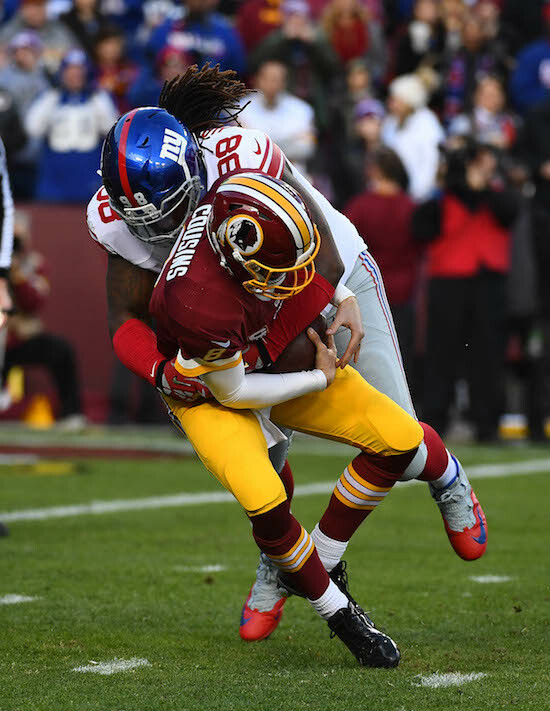 The Redskins got the ball back when Giants back-up quarterback Kyle Lauletta’s second pass of the game was intercepted, setting up Washington at the New York 33-yard line. Five plays later, Redskins back-up quarterback Josh Johnson scrambled for an 8-yard touchdown. The 2-point conversion attempted succeeded. Giants 40 – Redskins 8. New York went three-and-out. The Redskins cut the score to 40-16 after a 79-yard touchdown pass from Johnson to wide receiver Jamison Crowder, and another successful 2-point conversion attempt. The last Washington threat ended with under five minutes play when safety Michael Thomas picked off Johnson in the end zone. The Giants then ran out the clock. Manning finished the game 14-of-22 for 197 yards, three touchdowns, and no interceptions for a QB rating of 132.0. His leading targets were Barkley (4 catches for 27 yards) and Engram (3 catches for 77 yards). Barkley carried the football 14 times for 170 yards and a touchdown. The Giants accrued five sacks and and three interceptions. Linebacker Olivier Vernon (1.5), linebacker Lorenzo Carter (1.0), safety Sean Chandler (1.0), defensive end Josh Mauro (1.0), and linebacker Kareem Martin (0.5) all got to the quarterback. The interceptions were by Riley, Ogletree, and Thomas. Inactive for the New York Giants were wide receiver Odell Beckham, Jr. (quad), quarterback Alex Tanney, tight end Garrett Dickerson, center Evan Brown, nose tackle John Jenkins, cornerback Tony Lippett, and safety Kenny Ladler. 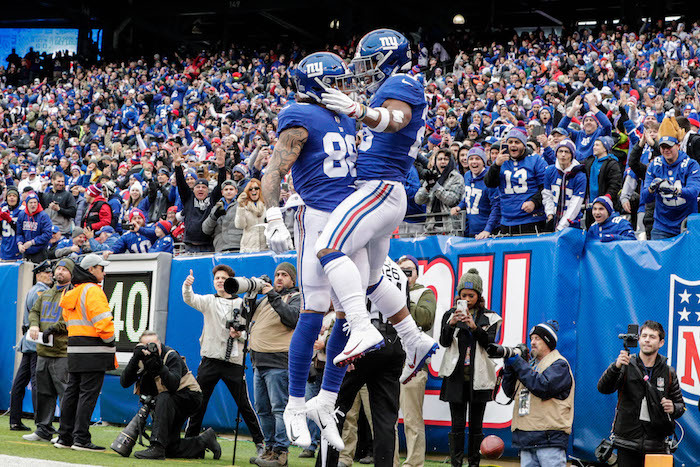 The New York Giants blew a 10-point lead against the Chicago Bears with less than two minutes to play, but persevered to win the game in overtime, 30-27, at MetLife Stadium in East Rutherford, New Jersey on Sunday afternoon. With the win, the Giants improved their overall record to 4-8. The Giants jumped out to a quick 7-0 advantage when linebacker Alec Ogletree intercepted a pass from quarterback Chase Daniel at the 8-yard line and returned it for a touchdown. Then both teams exchanged punts twice before the Bears tied the game by driving 70 yards in 10 plays. Daniel hit tight end Adam Shaheen for a 2-yard score. Momentum continued to swing in the direction of the Bears as quarterback Eli Manning was picked off on the ensuing drive, setting up Chicago near midfield at the end of the first quarter. However, the Giants got the ball back when Ogletree intercepted his second pass, this one at the New York 14-yard line, returning it 20 yards. After the Giants went three-and-out twice and the Bears once, Chicago took the lead on a 7-play, 74-yard drive that ended with a 1-yard touchdown run by defensive lineman Akiem Hicks. The Bears now led 14-7. The Giants punted for the fifth time in the first half on the ensuing possession. The Bears went three-and-out and New York received the ball with 1:14 before halftime. Although the Giants only picked up 18 yards, place kicker Aldrick Rosas kicked a 57-yard field goal with no time left on the clock. It was the longest field goal in New York Giants’ team history. At the half, the Bears led 14-10. The Giants started the second half on a high note. After receiving the kickoff, the Giants picked up 26 yards on three plays. Then the Giants ran a trick play that had wide receiver Odell Beckham pass the ball to a wide-open wide receiver Russell Shepard for a 49-yard touchdown. The Giants now led 17-14. After forcing the Bears to go three-and-out, the Giants put together a 13-play, 60-yard drive that ended with a Manning-to-Beckham 1-yard touchdown pass on 4th-and-goal from the 1-yard line. The Giants were now up 24-14 with four minutes left in the third quarter. The Bears picked up two first downs on their subsequent drive but were forced to punt. After a three-and-out by the Giants, the Bears finally managed to put together a scoring drive by moving the ball 56 yards in seven plays to set up a 36-yard field goal. Giants 24 – Bears 17. With just over nine minutes to go in the game, the Giants drove the ball from their own 8-yard line to the Bears’ 30-yard line. However, a 9-yard sack on 3rd-and-8 took the Giants out of field goal range. The ensuing punt was downed by the Giants at the 2-yard line. On Chicago’s first offensive snap, cornerback B.W. Webb forced wide receiver Taylor Gabriel to fumble, which was recovered at the Chicago 13-yard line by safety Sean Chandler. At this point, it appeared the game was all but officially won. But New York did not manage the clock well in the final 2:19 of the game. The Giants lost six yards and settled for three points after only taking 30 seconds off of the clock. Still, New York was up 27-17 with 1:49 left to play. The Bears’ first score was aided by a 32-yard pass completion and 15-yard roughing-the-passer penalty on Chandler. This moved the ball to the New York 8-yard line where Chicago was forced to settle for a 21-yard field goal with 1:13 left. Then disaster struck when a less-than-aggressive Beckham did not handle the onsides kickoff. The Bears recovered at the Chicago 47-yard line. The Bears completed a 23-yard pass on 4th-and-3 down to the New York 9-yard line with 11 seconds to play. After two incompletions, Webb was called for pass interference, giving Chicago a 1st-and-goal situation at the 1-yard line with three seconds left in the game. The Bears then ran their own trick play, a halfback pass by Tarik Cohen to wide receiver Anthony Miller with no time on the clock. The game was tied 27-27 and headed to overtime. The Giants won the toss. Running back Saquon Barkley picked up 29 yards on the first play of the drive. On 3rd-and-2, Manning found wide receiver Sterling Shepard for an 8-yard completion to the Chicago 30-yard line. The Giants only manged four more yards, but it was enough to set up a successful 44-yard field goal by Rosas. The Bears now needed to score on their ensuing possession or lose the game. The Bears kept things interesting by gaining 10 yards on 4th-and-7. Then on 4th-and-8 from the Chicago 40-yard line, the Giants came with an all-out blitz. Daniel threw a deep ball to wideout Taylor Gabriel, but cornerback Janoris Jenkins had perfect coverage over the middle and knocked the ball away to win the game. Offensively, Manning finished the game 19-of-35 for 170 yards, one touchdown, and one interception. His leading receivers were tight end Rhett Ellison (4 catches for 42 yards) and wide receiver Sterling Shepard (4 catches for 28 yards). Barkley rushed for 125 yards on 24 carries. Defensively, the Giants forced three turnovers. Ogletree picked off two passes, one which he returned for a score. The Giants also accrued five sacks, three by defensive lineman B.J. Hill and two by linebacker Olivier Vernon. The Giants were also credited with 10 tackles for losses and seven pass defenses. Inactive for the New York Giants were tight end Evan Engram (hamstring), linebacker B.J. Goodson (neck), linebacker Lorenzo Carter (hip), quarterback Alex Tanney, center Evan Brown, nose tackle John Jenkins, and safety Kamrin Moore. Wide receiver Sterling Shepard (ribs), linebacker Tae Davis (ankle), and safety Landon Collins (shoulder) were all dinged up in the game. Tight end Evan Engram (hamstring) and linebacker Lorenzo Carter (hip) did not practice on Thursday. Defensive end Kerry Wynn (concussion), linebacker B.J. Goodson (neck), linebacker Tae Davis (ankle), cornerback Grant Haley (hamstring), and safety Curtis Riley (shoulder) were limited in practice. The Giants practice again on Friday in preparation for Sunday’s game against the Chicago Bears. 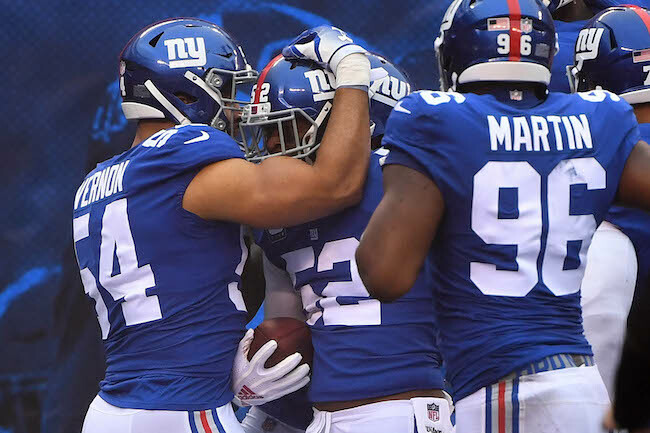 The New York Giants won their second game in a row and improved their overall record to 3-7 by defeating the Tampa Bay Buccaneers 38-35 on Sunday at MetLife Stadium in East Rutherford, New Jersey. Quarterback Eli Manning only threw one incompletion, running back Saquon Barkley scored three touchdowns, and the defense intercepted four passes, returning one for a touchdown. The Buccaneers significantly out-gained the Giants in a number of categories including first downs (31 to 19), total net yards (510 to 359), and net yards passing (359 to 196). But the Giants dominated the turnover battle (4-0). The Giants were 4-of-4 in red zone opportunities, while the Buccaneers were 4-of-5. The Giants scored touchdowns on their first two offensive possessions of the game. Wide receiver Corey Coleman returned the opening kickoff 40 yards. Four plays later, Manning found wide receiver Odell Beckham, Jr. for a 41-yard gain to the Tampa Bay 7-yard line. Two after that, Manning hit a wide-open Barkley for a 6-yard touchdown reception. The Buccaneers drove 68 yards on their initial possession, but were stopped on 4th-and-1 on the 12th play of the drive, turning the ball over on downs at the Giants’ 5-yard line. The NYG offense then responded with a 12-play, 95-yard drive that ended with Barkley scoring from five yards out. The Giants now led 14-0. After both teams exchanged punts, Tampa Bay cut the score to 14-7 with an 8-play, 64-yard drive that culminated with a 1-yard touchdown run by quarterback Ryan Fitzpatrick on 4th-and-goal. The Giants managed to drive the ball to the Buccaneers 37-yard line on the following possession, but Head Coach Pat Shurmur decided to punt the ball away on 4th-and-2. The Buccaneers threatened to score again before safety Michael Thomas intercepted Fitzpatrick at the Giants’ 13-yard line with less than 30 seconds before intermission. At the half, the Giants led 14-7. The Buccaneers received the ball to start the second half. On their second offensive snap, linebacker Alec Olgetree snatched a ball away from fellow defender cornerback Janoris Jenkins and returned it 15 yards for a defensive touchdown. The Giants were now ahead 21-7. Tampa Bay drove to the NYG 32-yard line on their second possession of the half, but Fitzpatrick was picked off in the end zone by safety Curtis Riley who returned the interception to the Giants’ 40-yard line. The Buccaneers bench Fitzpatrick after his third turnover. A 23-yard run by Barkley helped to set up a 52-yard field goal by Aldrick Rosas, giving the Giants a 24-7 advantage midway through the third quarter. However, the Giants’ defense then largely collapsed against quarterback Jameis Winston, who led the Buccaneers on four straight touchdown drives of 74, 77, 70, and 66 yards. Thankfully for New York, Manning and his offensive teammates also managed two touchdown drives of their own. The first was a 7-play, 71-yard affair that culminated with an 8-yard touchdown reception by Beckham on 3rd-and-5. The second was a 5-play, 67-yard drive, where the big play was a 54-yard gain by tight end Evan Engram. Three plays later, Barkley scored from two yards out. Despite all of this, Winston’s 41-yard touchdown with less than two-and-a-half minutes left in the game cut the score to an uncomfortable 38-35. The Giants went three-and-out and Tampa got the ball back with 23 seconds to play. But Winston’s first pass of Tampa’s final possession was intercepted by cornerback B.W. Webb at the Giants’ 25-yard line, ending the game. Offensively, Manning completed 17-of-18 passes for 231 yards, two touchdowns, no interceptions, and a QB rating of 155.8. Beckham was the only Giants’ player to catch more than two passes, catching four for 74 yards and a score. Barkley rushed for 142 yards on 27 carries. He scored on two runs and added another touchdown on a pass reception. The good news for the defense was the four interceptions (including one for a score) and the stop on 4th-and-1 at the 5-yard line. But the defense allowed over 500 yards of offense and five touchdowns. The Giants accrued only one sack (by linebacker Kareem Martin). Inactive for the New York Giants were quarterback Kyle Lauletta, wide receiver Jawill Davis, center Evan Brown, defensive end R.J. McIntosh, nose tackle John Jenkins, cornerback Tony Lippett, and safety Kamrin Moore. Defensive end Kerry Wynn left the game with a concussion and did not return. The Giants 38 points was their highest total since November 1, 2015, when they lost at New Orleans, 52-49. It was the most points they’ve scored in a victory since a 45-14 victory at Washington on September 25, 2014. Quarterback Eli Manning’s 94.4 completion percentage is a Giants record in a game with at least 10 attempts. Running back Saquon Barkley is the first Giants rookie to score on a reception and a run in the same game since wide since running back Butch Woolfolk vs. the Houston Oilers on December 5, 1982. Barkley’s receiving yardage total for the season is 540, a Giants record for a rookie running back. David Meggett previously held the record with 531 yards in 1989. The New York Giants have activated defensive end R.J. McIntosh from the Reserve/Non-Football Illness List. To make room for McIntosh on the 53-man roster, the Giants waived wide receiver/returner Quadree Henderson. McIntosh was drafted by the Giants in the 5th round of the 2018 NFL Draft. An undisclosed ailment prevented him from practicing all spring and summer. McIntosh finally began to practice on October 16. Today was the deadline for the Giants to active him, or McIntosh would have been forced to miss his whole rookie season. The players are off on Wednesday and return to practice on Thursday. The New York Giants have traded nose tackle Damon Harrison to the Detroit Lions in exchange for a 5th-round pick in the 2019 NFL Draft. Harrison was originally signed as an undrafted rookie free agent by the Jets after the 2012 NFL Draft. The Giants signed him as an unrestricted free agent in March 2016. In his first season with the Giants, Harrison had a superb year, starting every game and finishing the regular season with career highs in tackles (86) and sacks (2.5). Harrison also was arguably the best player on the team in 2017. Despite dealing with nagging ankle and elbow injuries, Harrison started all 16 games and finished the season with 76 tackles, 1.5 sacks, three pass defenses, and one interception. This year, Harrison started all seven games for the Giants and accrued 31 tackles and one forced fumble. The New York Giants have re-signed tight end Garrett Dickerson to the Practice Squad. The Giants originally signed Dickerson in June 2018 as an undrafted rookie free agent, and then signed him to the Practice Squad and 53-man roster in September. The Giants cut him from the 53-man roster last Sunday. The Giants also waived linebacker Ray-Ray Armstrong from Injured Reserve. Armstrong was placed on IR on October 16th with a concussion. Before suffering the injury, he had played in six games with one start, accruing 20 tackles. Armstrong was originally signed as an undrafted rookie free agent by the St. Louis Rams after the 2013 NFL Draft. He has spent time with the Rams (2013-2014), Oakland Raiders (2014-2015), and 49ers (2015-2017). The Giants claimed Armstrong off of waivers from the San Francisco 49ers in late November 2017. Armstrong played in five games for the Giants in 2017 with one start. Not practicing on Wednesday due to injury were linebacker Alec Ogletree (hamstring) and wide receiver Jawill Davis (concussion). Guard Patrick Omameh (knee) and wide receiver Russell Shepard (neck) were limited. The Giants practice on Thursday and Friday in preparation for Sunday’s home against against the Washington Redskins. The team’s coordinators will address the press on Thursday.